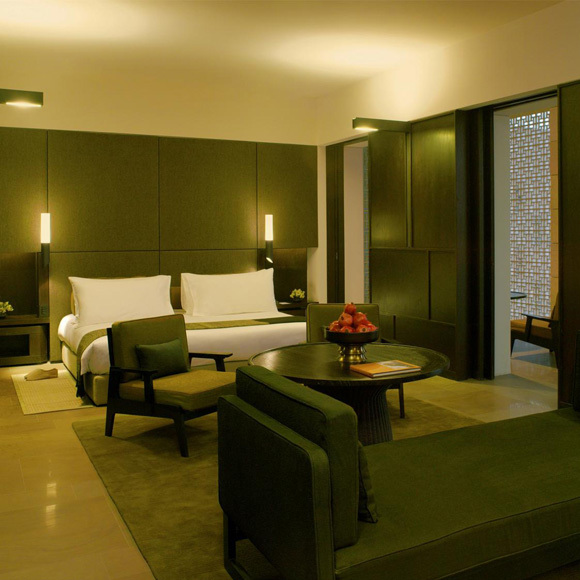 The newest addition to Delhi’s stylish hotel crop is Aman’s city center hotel resort located next to – and enhanced by the leafy green of – Delhi Golf Course. A new build, the two stone towers are remarkably graceful and light. The interiors, of wood, glass and stone, are the work of Kerry Hill, preferred designer of a large number of AmanResort’s properties. The hotel block of 8 stories carries 4 rooms and 1 suite per floor, each with its own very large, square plunge pool. The residential block next door has 28 rooms with the same look and similar floor plan. 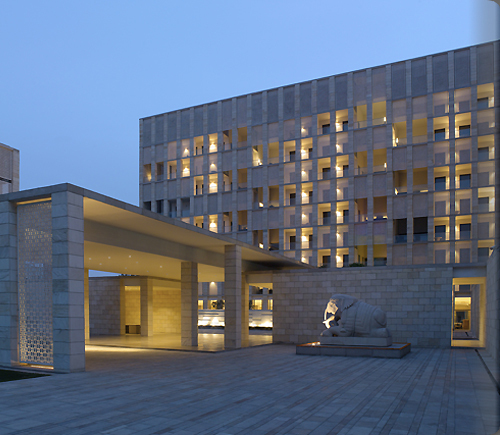 With an excellent restaurant on the ground floor, the best spa in Delhi with male and female treatment rooms, hammam and resting areas, with a cigar bar, a wine bar, library and gallery, staying at Aman New Delhi feels more like settling in to a luxury residence with service – superb, friendly service that is – than being in a traditional hotel. No check in desk (check in takes place in your room) and all the staff appear to be equally able to attend to your daily plans. GM, Robyn Bickford, even gifted me a guide for shopping with her favorite shops checked off. That is pure Aman thoughtfulness, the reason one chooses never to go anywhere else unless forced to. Rooms are delightfully spacious (the largest rooms in Delhi) and quiet; the beds divine after a long day’s sightseeing; the pool indulgent by moonlight. 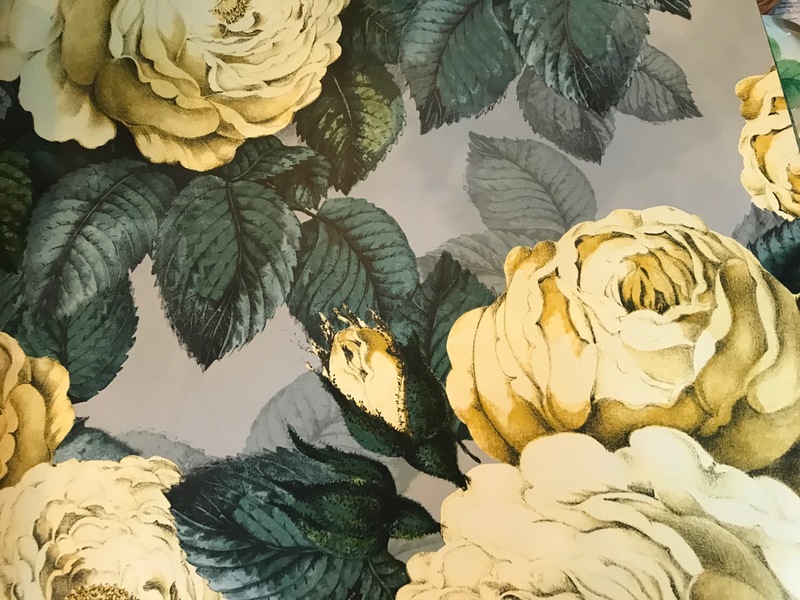 These are also classic Aman reflections: No matter where you travel, staying at an Aman property reminds you of the pleasures of peace and quiet, of the deliciousness of pervasive floral fragrance, of the rarity of service that seems at once effortlessly warm and efficient. 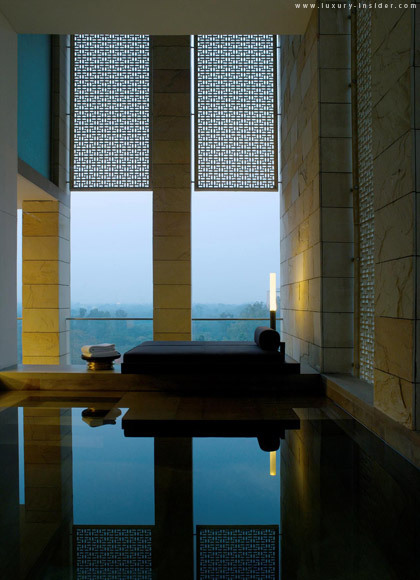 To stay at an Aman is always, for me, like coming back home.